These two photos were taken near the Victoria Fountain at the Old Steine gardens in Brighton. 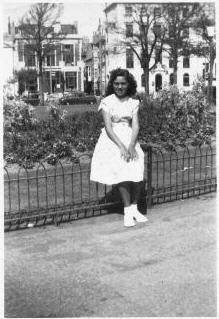 The first photo is of me, at the age of thirteen in 1957, sitting on the little green fencing that used to be there. 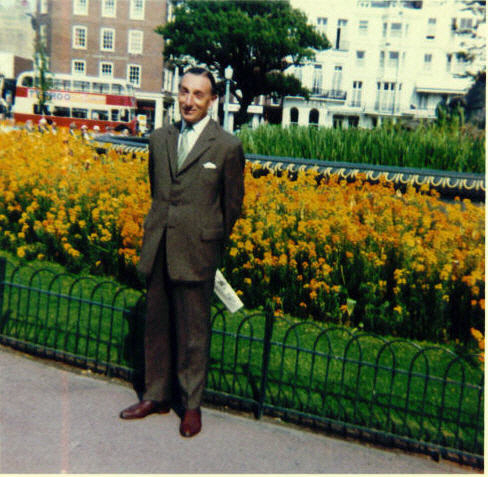 The other photo is of my Dad with all the lovely flowers behind him. They show how the gardens used to look. The Old Steine has fond memories for me at about the same as Maralyn. In the summer the flowers were beautiful, and in the winter the coloured lights that hung in the trees seemed to twinkle on cold and frosty nights. The lights at the fountain changed colour every now and again which gave it a beauty different from the daytime. Lovely memories.